The North Shore Craft Group are holding their 59th annual Contemporary Art and Craft exhibition and sale from Friday 8th to Sunday 10th July at Thornleigh Community Centre, Corner of Phyllis & Central Avenues, Thornleigh. Sounds interesting. Fran is having a wonderful time with the little Sample it Loom. It was warped on a recent Wednesday night and off she went. Her colour scheme is blues and white and with a blue warp. 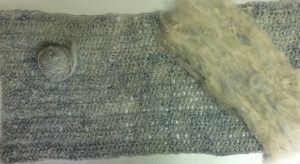 We are looking forward to seeing Fran’s finished scarf. 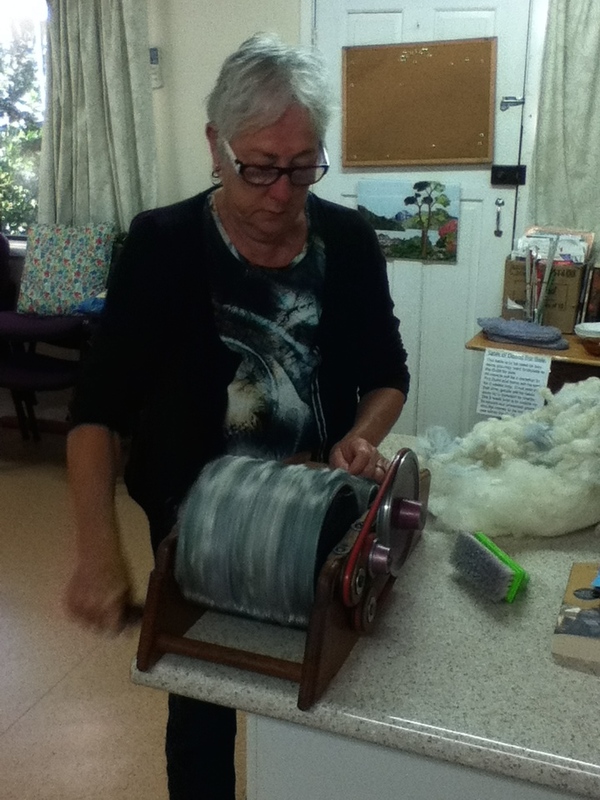 By Lyn A.
Jenni is carding some wool for a lap rug that she is making for a gift. Below you can see a carded batt, a ball of the spun wool, and the already crocheted section of the rug. Very nice Jenni! Jill has returned after an absence in England for the Marathon and breezed in with this lovely community quilt on her return. Busy people achieve wonderful things. 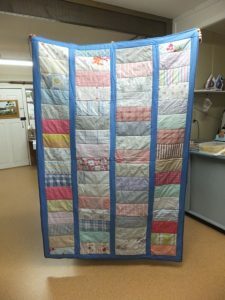 This quilt will be loved by its final recipient. Thank you Jill. By Lyn A. 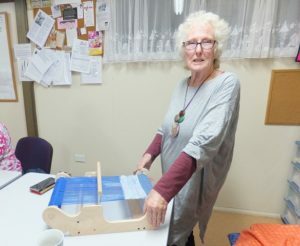 This post is about a project initiated by a lady called Martein van Zuilen who was born in Holland, but now lives in Perth. 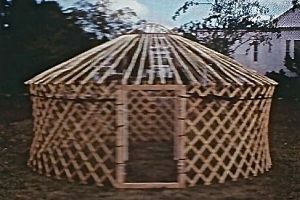 The project is called The Australian National Yurt Project which she founded in 1997, and with a lot of help the yurt was completed in 1998. In 1996 Martein travelled to St Petersburg in Russia and to Denmark to study the history of felt from every part of Central Asia, then on to Mongolia to learn the history and significance of felt in nomadic life. 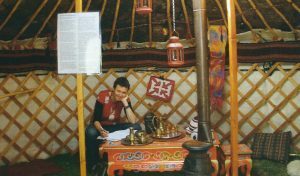 There she observed artisans making felt on the vast grass steppe using raw fleece, no soap, cold water and the power of horses to make it happen. 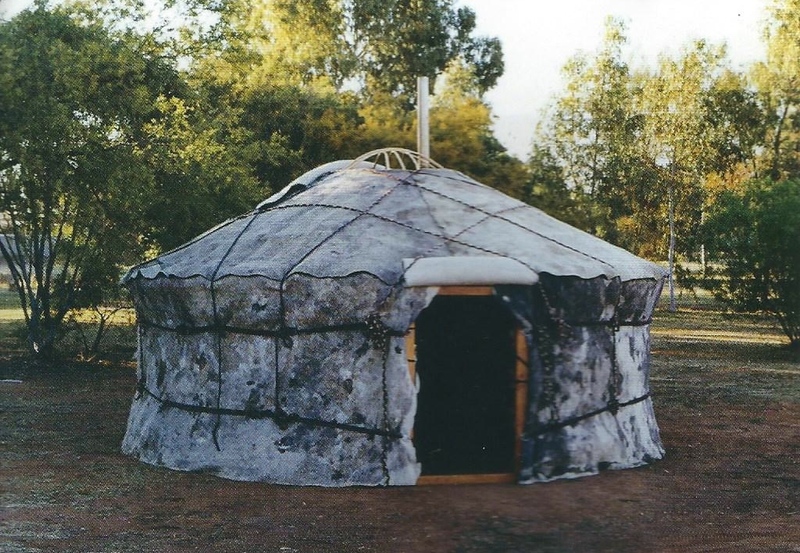 Martein then returned to Australia to start her project, and with the help of The Australian Forum for Textile Arts (TAFTA) and as many people as possible the Yurt was built using donated raw fleece, no soap and cold water. Martein travelled 12,000 kilometers and across five states to work with felters on large pieces of felt. Two pieces were sown together in a semi-circle to make the roof, and a lady called Kerry Bryan donated her time and using recycled timber made the frame, and in all 21 metres of felt were made. On the night of the Fibre Forum at Mittagong they all slept in the finished yurt. This information was found on Martein van Zuilen‘s website. 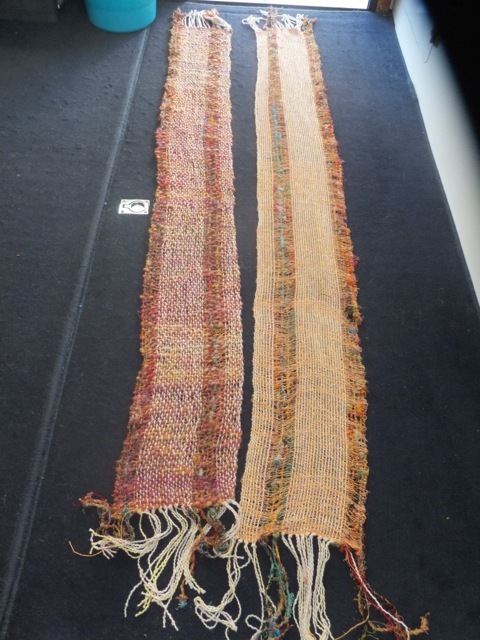 These two scarves are made up with the same warp. I put enough on the loom for these and used different weft yard to create the difference in the look. The little sampleit loom is so easy to get started on and produce in no time. All done on the boat. By Lyn A. Sue is doing such fantastic artful work towards her Quilt. 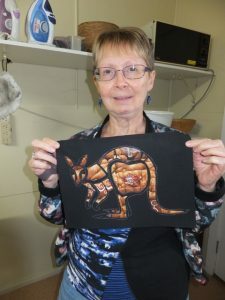 Sue is doing an appliqué quilt of Australian animals in Aboriginal prints. The technique is drawing onto the fabric, then the appliqué and painting the outline. This all sounds remarkable and we are all looking forward to seeing and learning how you have achieved the finished item. This will certainly have a lot of WOW factor. By Lyn A. A long time ago, in 2012, we had a dyeing day at the Cottage. I had forgotten that I had these samples, but found them when I was doing a tidy up the other day. This day happened before we had a website so I thought I would write about it to remind us all who were there what a fun day we had. Jenny C ran the day for us, which is always fantastic because Jenny is so knowledgeable. We split the fleece and weighed something like 50 or so, 50g lots and had a multitude of pots on the ground with fleece soaking in them. We started by choosing our four base colours – a blue, a yellow, a green, and a red. 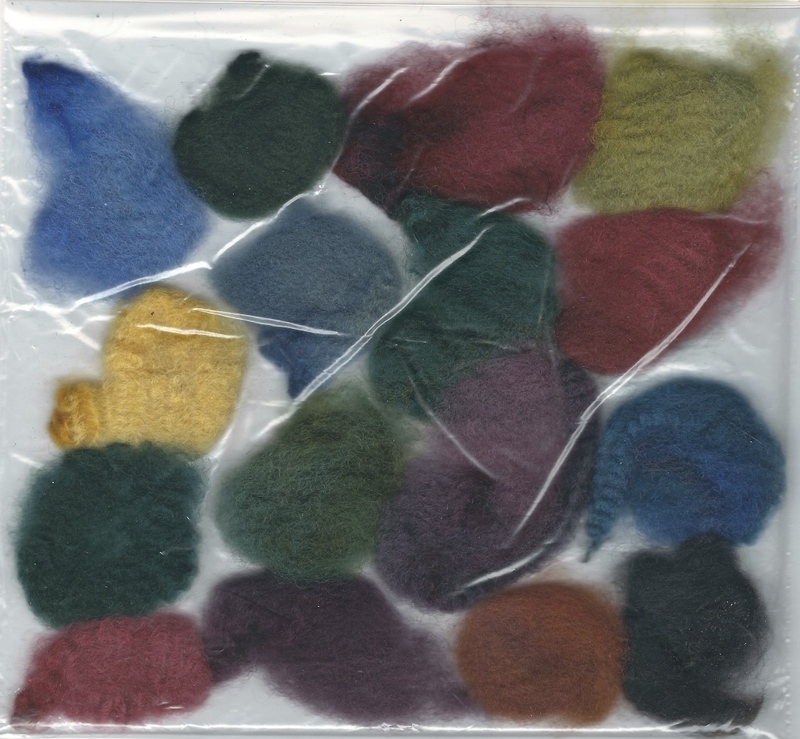 When the base dyes were completed we removed the fleece, and then divided the dyebaths so that we could dye some of each of the other colours to get twelve more colours. You can see all the colours that we created in the picture above. The colour combinations can be seen in the table below. It was a real joy seeing how each of the colours turned out. We were often surprised to see how some of the combinations turned out. I think we may have done a third lot too, for instance dyeing some yellow-red in the green base, which would give us 48 colours all together, which sounds about right. I wish I had more photos of the samples because we had such an amazing colour range. 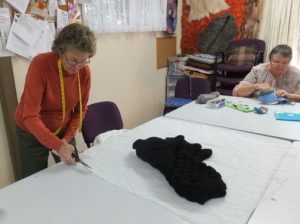 Bev is cutting out a pattern from Charlottes poncho, for her to felt for herself. 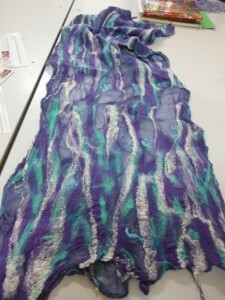 The pattern has to be cut bigger to allow for the shrinkage which occurs in felting. We are looking forward to the end result at one of the felting days. Just a quick note to let everyone know that the felting days have changed. They were the 2nd and 3rd Thursdays of the month. This has now changed to the 2nd and 4th Thursdays of the month. Thank you ladies.